Thank you so much for your suggestions about wrapping cupcakes in tulle and securing with a hair scrunchie. I recently had a fairy party for my five year old daughter and was wondering what to do for the birthday cupcakes. I made vanilla cupcakes, iced them with a pale pink buttercream frosting and then topped them with a fairy decoration. Because the theme was fairies and little girls do love pink and glitter, I made some hair scrunchies from a glittery silver fabric. I cut circles of pale pink tulle which I held in place with the scrunchie. They made a gorgeous display when I put them on my pink tiered stand. I was really impressed with how good they looked. They became a real centrepiece and a talking point amongst the other moms. 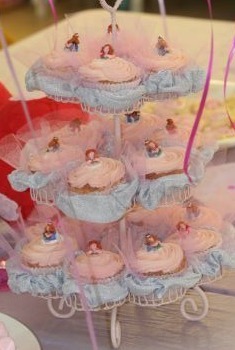 The fairy cupcakes were easy to make and easy to decorate and looked fantastic. The moms even asked if I take orders!! I have two younger daughters and I'll definitely be doing this again. They look unsurpassingly!! Can you please write the recipe to them? I'd love to congratulate my little daughter with such a gorgeous present.